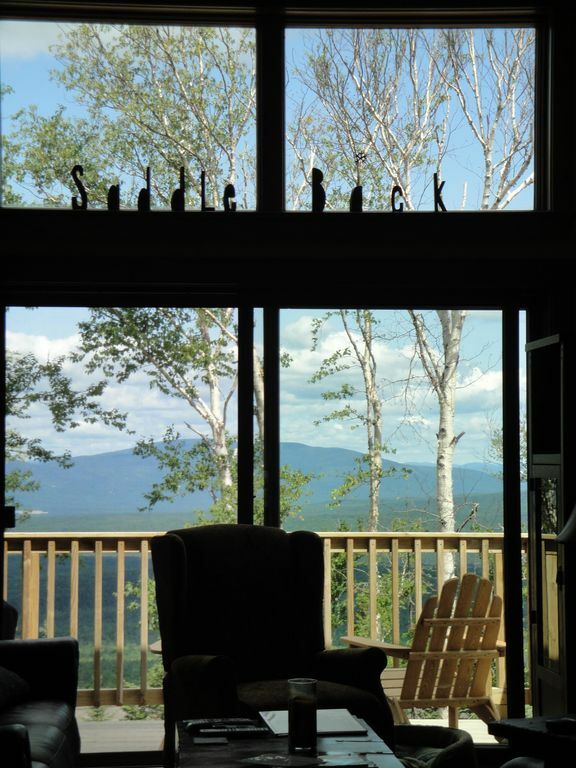 High in the mountains of Western Maine sits a luxurious 4 bedroom ski-in ski-out condo at Saddleback Mountain. Enjoy the spectacular views of the surrounding mountains and lakes from 2700 ft. of elevation along with 8000 acres of unspoiled wilderness. This well-appointed get-away offers access to the new Saddleback Marina on Rangeley Lake as well as pristine Saddleback Lake. Take in the fresh mountain air on a private deck to enjoy the morning sunrises and evening sunsets. Cook and entertain with a Weber Grill or in a Custom Built kitchen with a center island, and a large dining area that sits up to 12. After a full day of countless available outdoor activities, relax in a living area that includes antique cherry wood floors, dark leather furniture, radiant heat, exposed timbers, a field-stone fireplace and a mounted 42 inch plasma TV. Wedding Destination: In the Summer, Spring, and Fall months, Saddleback transforms into a beautiful wedding ceremony/reception destination. The base lodge at Saddleback is arguable the nicest in the East. The dramatic views of the mountains and lakes coupled with a grand stone fireplace make a perfect backdrop for such a wonderful celebration. The slopeside condo is a perfect place to accomodate traveling guests. Appalachian Trail: The Appalachian Trail, which runs from Georgia to Maine's Mt. Katahdin, also runs runs across the ridge of Saddleback Mountain. This section of the trail is known as one of the most scenic sections of all. At 4120 feet elevation and above treeline, there are 360 degree views of unmatched beauty. Rangeley Lake State Park : Rangeley Lake State Park, located just minutes off the Saddleback access road, consists of 869 remote acres, on 10-square mile Rangeley Lake. The lake is famous for landlocked salmon and trout fishing. Visitors can enjoy watersports, picnicking, hiking,camping, wildlife watching, and photography. The campground and day-use areas offer picnicking, swimming, and a concrete boat launching ramp with floats. There is a children's play area, hiking trails, and modern restrooms with hot showers. There are 50 campsites situated among fragrant spruce and fir trees, and some sites have water access. Both bathrooms boast beautiful cherry wood vanities with granite counter tops. The downstairs bathroom has an air jet jacuzzi. Although there is no outdoor activity equipment supplied at the property, all the outdoor activities are offered in spades in the area. There is wireless broadband access in the property as well as in the Base Lodge at Saddleback. My girlfriend and I stayed up there with another couple and stumbled upon 8-10 inches of fresh Utah powder. I have to say one of the best 2 days in the last 10 years of skiing in the Northeast. The condo is high end - beatiful hardwood floors, two floors, comfortable beds and clean bathrooms. The views of the mountains are to die for. I've been up to the mountain before, but at a seperate location. It's a true ski / on ski off condo with immediate access to the chairlift, but quiet and quiant and away from the lodge sitting at the very top of where houses are built - PERFECT in my opinion. If you're skiing at Saddleback Mountain and you're renting a house, I wouldn't look any further! Great times and I'll be back. My boyfriend and I, as well as another couple had the opportunity to vacation at Saddleback Mountain for a mid week stay (Wed-Sat). The condo was amazing, from its cleanliness to its superior appliances and well furnished living space. I would HIGHLY recommend this location to anyone (from singles, to couples, to large families). We attended a wedding at the Saddleback Resort and this condo was the perfect rental. Clean and very well equipped with a nice view, we enjoyed our mountain getaway here. Very impressed with the overall quality. The pictures do not do it justice! A classic Maine lodge feel and very user friendly. Everything about the place was high end from the kitchen appliances and the leather furniture to the comfortable beds and the Weber grill. The views of the mountains and lake are outstanding. Rangeley is a very nice, qaint lake town with a lot to offer for everyone. Loon Lodge is a great place for dinner and drinks. And there is countless outdoor activities in and around the area. Overall, a great value and highly recommended! We stayed at this condo and were so impressed. It had all of the amenities you could imagine and the best views! There are so many hiking trails around the mountain and it is such a beautiful place to take walks, head downtown for shopping / lunch and explore what Ranegely has to offer. I was more than pleased and at the rate they are offering it was a steal! I will be heading back for ski season for sure! The condo is pretty but right next door are several foundations where building has ceased. Not pretty. Nothing is close by and the lake is not in close proximity. There is no gas grill and no seating on the deck. Must be o.k. for skiing but summer not so good unless you are an avid hiker and don't mind construction debris or driving distances for amenities. The base lodge offers no WiFi and it is extremely difficult to get a phone signal. The view is nice but only one TV in main living room. Not worth the hefty price tag. In response to this review, there are a couple of issues that should be cleared up. Construction in the condo development is ongoing and is slightly behind schedule. However, landscaping surrounds the property and the construction does not impede the views from the condo. All amenities and downtown Rangeley are less than a 15 mintues drive from the property. The lake is on Saddleback Mountain so it's very close by and details on access to the lake should be dealt with at the base lodge. Rangeley Lake is in the center of Rangeley. There is now a gas grill and outdoor seating available. The beautiful base lodge does offer WiFi but an inconvenient lightning storm during this renters stay breifly disabled the service. The Rangeley Lakes Region features 110 sparkling lakes, ponds, and streams, thousands of acres of wild forests, and abundant wildlife. It is truly one of the most unique 4 season destinations in the country. In the spring, Rangeley's waters are filled with fisherman. Moose emerge from the forests after a long winter. Birds flock from afar to enjoy the warmer months. In the summer there's hiking, mountain biking, fishing, golfing, canoeing, kayaking, swimming, water skiing, tennis and most any other outdoor activity. In the fall, there is foliage season where one can experience some of the world's most spectacular foliage. Golfing is wonderful this time of year, as hunting season emerges. Winter brings Nordic and alpine skiing and snow shoeing. Saddleback Mountain is getting international attention as the place to be for skiers as it starts a 10 year expansion plan. It boasts over 4000 ft. of elevation coupled with the some of the best views and terrain in the East.